Coffee, Bacon, Flapjacks! 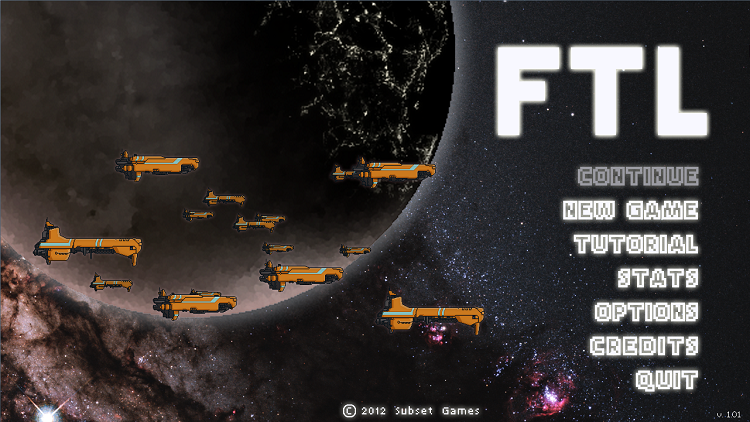 : FTL is Really Fun! 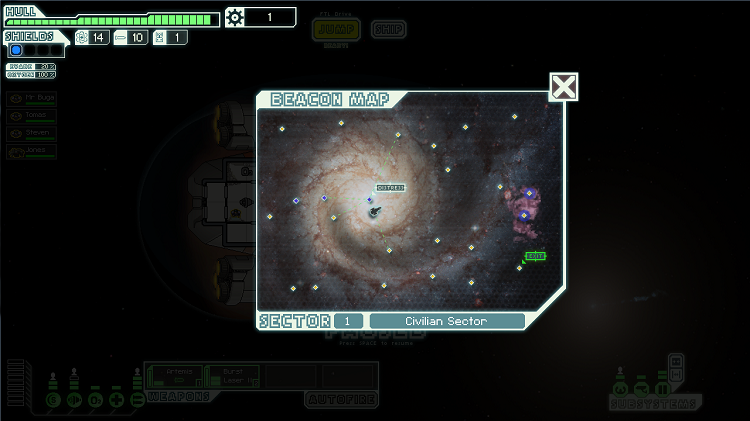 So, I've been playing a bunch of Faster Than Light since it came out, and boy is this game fun. If you're unfamiliar with it, FTL is pretty much a roguelike in space where you command a ship trying to stay ahead of rebel forces as it races back to its headquarters with vital information for the federation (not that federation, just the one they're using for this game). However, instead of piloting the ship yourself and blasting away at enemies all pew pew pew, you actually tell your crew what to do. Get someone piloting the ship, have another person man the weapons, and another taking care of the engine room (you can also put someone on shields, make boarding parties, etc), then fly from one star system to the next, sometimes helping people in distress, and other times engaging in battle (or both!). It plays a lot more like a sim combined with a strategy game, and it has been eating up inordinate amounts of my time. It's definitely a game much more suited to those who like micromanagement. You can tell your crew what systems to focus on, who should repair what when something gets damaged, pick people for a boarding party (assuming you have a teleporter on your ship), decide what systems to focus attacks on in battle, and how to upgrade your own ship. There are just so many options. 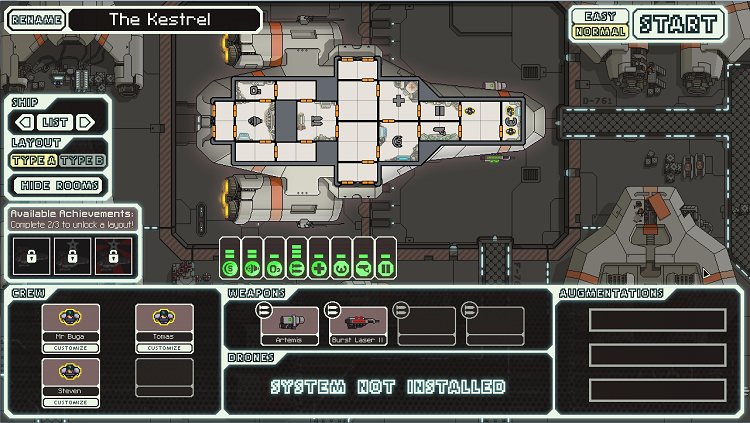 Up to this point, I only have the initial ship players get in the game, the Kestrel, and I just unlocked the Engi ship the other night. I like the Kestrel a bit more even though its the starter ship, as a lot of its key systems are more centrally located (shields, internal scanners, doors, weapons, and med bay), so if something gets damaged and needs repairs it's a lot easier to get someone there to fix it and return them to their post after. The only systems that are a bit out of the way are life support and the engine room, but it's still a more preferable setup than the Engi ship, in my opinion, as that vessel is more ring-shaped and takes a bit more travel time to get to certain systems. Also, I'm a bit more partial to the weapon systems on the Kestrel (missiles and a laser). Systems can be upgraded if you have enough money, and it's up to the player how they want to approach this. One can go for high defense and start pumping cash into things like shields and engines, or be very offense oriented and crank up their weapons systems. There's also a bunch of sub-systems like internal sensors, doors, autopilot, and such that can be improved. Whatever the case, just be sure to improve your reactor too so that you have enough power to use these fancy new upgrades. I've actually grown partial to upgrading my doors as it can be incredibly useful when my ship gets boarded during a battle. I'll open my airlock, and all of the doors leading to where the enemy is on the ship, and the oxygen will get sucked into space. With blast doors it takes longer for invaders to break through them and get into the next room, exposing them to oxygen deprived areas for longer. Once they realize what's going on, they'll scramble to a safe zone in search of air only to be greeted by my crew and their trusting blasters when they arrive. Good times. The ship battles are quite a lot of fun, and they happen often. It feels a lot like Star Trek in some ways as I remember Captain Picard always telling Worf what to target on an enemy ship when the Enterprise got into a fight. It was usually, "Target their weapons" or "Target their engines" or whatever. The same sort of thing happens here with the player deciding what systems to prioritize in a battle. 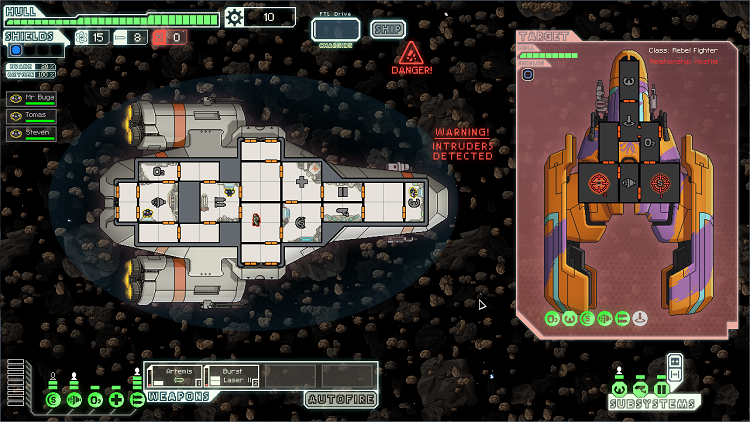 I tend to go after the shields first, and then work on their weapons systems. It keeps them defenseless, and allows you to really do a number on a ship. 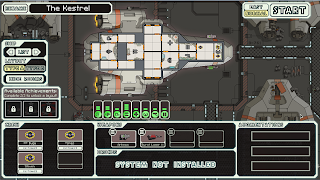 FTL hasn't even been out a week yet, and I already love it to pieces. It's fun to fly out into the cosmos and get into some fight, soup up my ship and fight some more, then die spectacularly when I bite off more than I can chew...only to start the whole process over again.